This photo series was taken on August 14, 2015 at 4:19 PM. The location was in the Building Museum in Washington DC. The "Take it!" came from having read about this exhibit in our local newspaper. It captured my curiosity and I included a stop at it along with a number of other errands that called for me to be in downtown DC. The building has a very large open interior that is atrium like and conducive to putting in large displays. 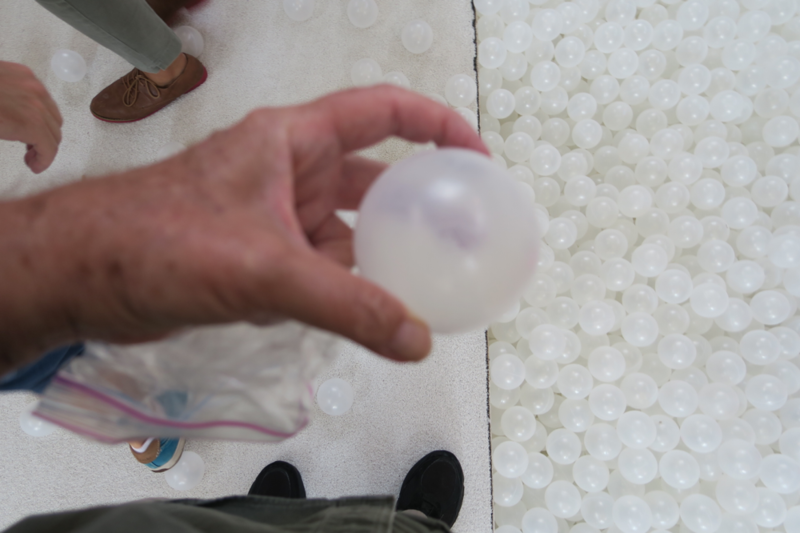 This one was built to resemble a beach with beach chairs, beach umbrellas and a sloping floor that gently led the participants to a huge box that contained white plastic spheres as shown in my hand in one of the photos. This is a clever adaptation of what is often a plaything for very young children, however in this application - it was being enjoyed by people of all ages. The glee escaping from adults and children alike was simply amazing to stand by and observe. 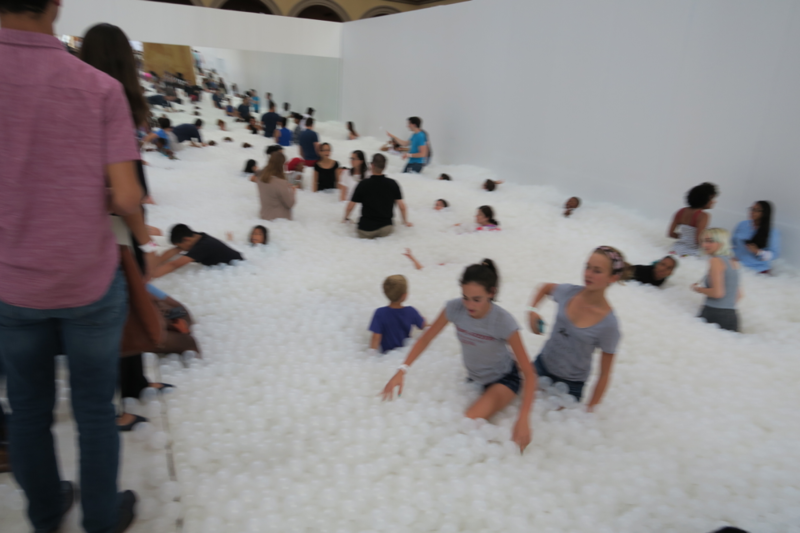 I think a very large part of the joy of the experience came from people being able to move about in the plastic spheres and not have to worry about their children having to beware of water which is the usual beach scene. No one was in danger of drowning. What a relief! The After Take: Word had gotten out about this, and many already knew about it. Several had been there and enjoyed themselves with their family's immensely. Rare are these public worry free events. As chance would have it, I wandered into the gift shop after the observing of the glee and happened upon the director of the building. A very nice fellow that told me that they had gotten the plastic sphere's from North Carolina rather than China. He said they were confident of the content of the plastic and this was very important. He said at the end of each day they sanitized all of the spheres as well as all surfaces. This fact made me that much more appreciative of the care given to the safety and sanitation provided to protect the public. Here is hoping an unexpected joy comes your way too. Our kids would absolutely love this, hell I would love this, it looks like a blast. I'm afraid to show our younger children this one because I know they will beg us to take them. They won't understand "no we can't, its 5 states away from us." I read about this exhibit when it was being featured. How cool is that? Whoever came up with the idea is a genius. Too bad this isn't around anymore. It would have been so cool to take our students to when we went out there. This is incredible! Thank you for sharing, I would have never known about it. I was telling Teri how excited I was to get to see this when I come out for my first student trip as one of the chaperones this upcoming May. She then had to break the news that it was a limited timed exhibit and was no longer around. Bummer that it isn't permanent.